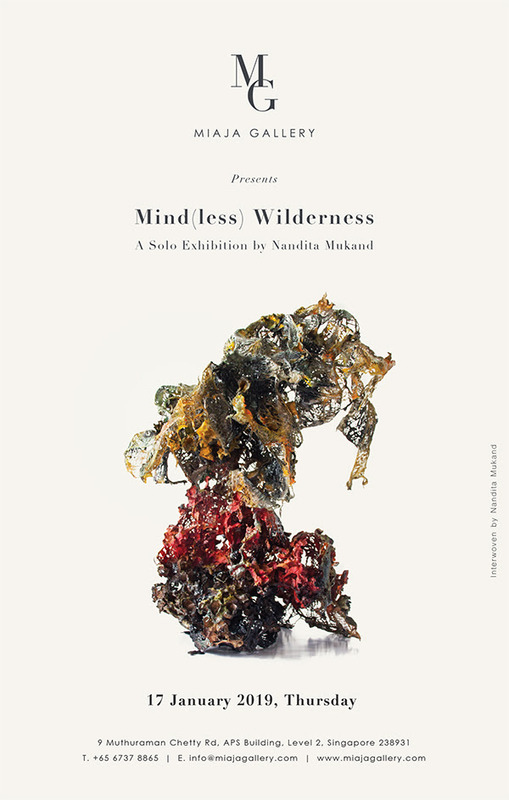 In collaboration with Ikkan Art Gallery, Miaja Gallery will present Singapore based-artist Nandita Mukand’s solo exhibition “Mind(less) Wilderness”. Curated by Tanya Michele Amador the multi-disciplinary exhibition runs during Singapore Art Week (SAW) from 17 January to 1 March 2019 at Miaja Gallery’s new art space. Drawing upon resources as diverse as neuroplasticity, quantum physics, contemporary Buddhist texts, and ancient Vedic literature, Mukand’s exhibition mingles observations of how plants grow in the forest with the workings of the urban mind. Through science, which suggests that the human brain has huge potential for renewal and growth, she ponders how plants effortlessly adapt to a variety of environmental conditions, taking on graceful forms as they grow, while similarly, humans also adapt to their circumstances. Yet, old neural pathways result in addiction to familiar thought patterns, often slowing down our ability to change and adapt at the fast pace that contemporary living demands, resulting in a feeling of enslavement, unable to catch up. Using interwoven threads of cloth to epitomise the myriad ways in which today’s urban life is interconnected, pulling one thread in this fabric has far reaching implications that are often difficult to anticipate. Seeds find their way into Mukand’s work, representing the potential for new ideas to blossom into fulfilling creations or to remain dormant. Resilience is encountered time and again amongst the plant life of the forest. The whole is encased in harmonic layers of epoxy resin, a type of plastic. Plastic, an integral part of our lives today, signifies contemporary belief systems that restrict our true potential.